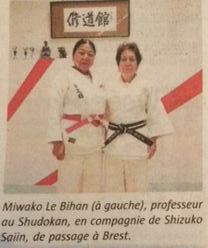 Miwako Le Bihan, professor of judo at Shudokan (on left in photo above), welcomed her old friend and training companion, Shizuko Saiin (on right) for a one-month visit in Brest. Shizuko had last been here three years ago. The two of them trained and suffered together at Kodokan in Tokyo for about ten years. Saiin, now 5-dan, began training judo at age 35. This year she won the championship in her age and weight class and and is ranked as number two internationally. But judo is not the only thing she does. She is also works as a teacher of book-binding. On each stay in Brest she practices the art of book-binding in Moulin de Kéréon in Saint-Sauveur, with Dominique Doyard. Saiin 5-dan gave various lectures about the art of book-binding in Japan. The judokas of Glasgow Street will once again have the benefit of her experience and a chance to get together with friends. Before returning to Japan, Saiin 5-dan will go to Switzerland, a country that she knows, and will stay for one week there. Comment: Saiin 5-dan also stays busy operating a small printing company and teaching judo in Chigasaki, the surf capital of Shonan, where it was rumored that Rickson Gracie once thought about maybe surfing (he decided not to). Saiin 5-dan's husband is also a judoka 5-dan (see here for more about him). In a recent interview, Roberto asked the Saiins (both husband and wife) if they had any opinion about disgraced former 2-time Olympic judo champion Uchishiba Masato, who after getting out of prison, entered a BJJ tournament as a blue belt (full story here). They didn't have an opinion, apparently, but Mrs. Saiin's facial expression seemed to suggest bafflement, as in "how can men be so dumb? ", although maybe Roberto was projecting (despite knowing very well how men can sometimes be so dumb). On the other hand, it's a valid thing to wonder. Mr. Saiin had nothing to say. They, and Roberto, seemed to agree that Uchishiba might have thought that, as a 2-time Olympic champion and national hero, he was free to do whatever he wanted (despite being married with two children, or rather, formerly married with two children). But Japan is not America. In America, you really can get away with anything if you are big enough, famous enough, rich enough, have a good rap. Well, almost anything, a lot of the time. Anyway, it sometimes seems that way. But not in Japan. In Japan anyone who steps out of line gets chopped down fast. Life in Japan is a team sport. The idea is like, if you want to go your own way and do your own thing, do it somewhere else (and some people do that. They are so few and so unusual that there are weekly TV shows especially about them). There has never been a myth of rugged individualism in Japan and unlike America, no one believes there's always a second chance. It's hard enough to get a first chance let alone two chances. Then again, maybe Uchishiba believed it and that's why he put on a blue belt. Time will tell if he's the rare exception. If so, thank BJJ for it. Saiin 5-dan mentioned that in Brest, the kid's judo classes consist almost entirely of ne-waza [寝技, ground technique], completely the opposite of Japan, she commented. Judo in France is very different from Japanese judo, she felt. She didn't want to over-generalize, but at least in Brest, the emphasis struck her as being more "spiritual" than in Japan, with posters of Japanese kanji here and there, possibly to suggest that the "Japanese way" of doing some things is a good one to emulate. A little less ego-centric, win-at-all costs, competitive mentality is not a bad thing, some people think, especially for the little ones. Regarding the difference between the French judo mentality and the Japanese judo mentality, see Negative Judo. (c) 2018, Roberto Pedreira. All rights reserved.